Home Adventure Cycling Tour The Basque Country – Day 1: Germany’s Schachmann Wins Individual Time-trial. Tour The Basque Country – Day 1: Germany’s Schachmann Wins Individual Time-trial. 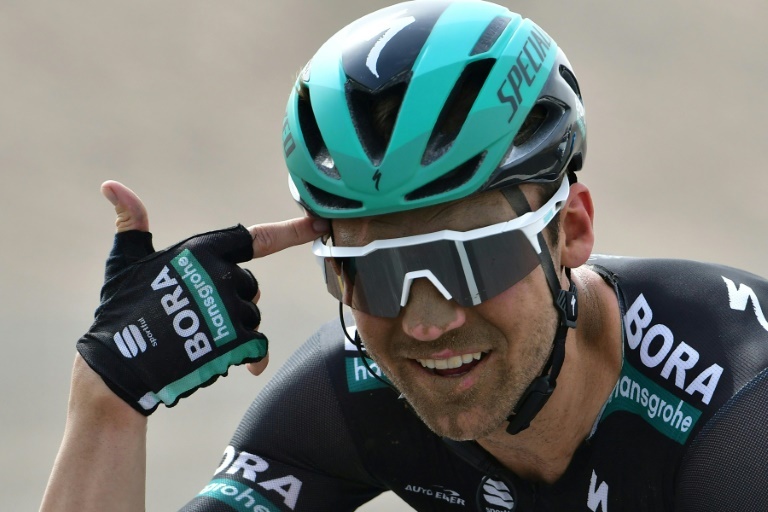 Germany’s Maximilian Schachmann of the Bora-Hansgrohe team won the 11.2km Tour of the Basque Country opening day individual time-trial on Monday. Fresh from a stage win at the Tour of Catalonia, Schachmann timed 17min 10sec to edge Dani Martinez of Education First and Sky’s Michal Kwiatkowski by nine and 10 sec on rain slick roads with several short sharp ascents around Zumarraga. Milan-San Remo winner Julian Alaphilippe was fourth while Tour de France winner Geraint Thomas and fellow Briton Adam Yates were also in the top 10 on this first of six stages. “I have no idea how I menaged to win this ahead of Alaphilippe and Kwiatkowski,” he said after the race. “It’s a verty special win because it’s a very difficult win,” he said. The race continues with three hilly stages and two mountainous ones culminating with a short steep 118.2km ride around Eibar on Saturday. “I’m fine, maybe just lacking a bit of rhythm,” said pre-race favourite and runner up here last year Landa, who broke a collarbone racing in Mallorca in January. 1. Maximilian Schachmann (GER/BOR) 17min 10sec, 2. Daniel Martínez (COL/EF1) at 9sec, 3. Michal Kwiatkowski (POL/SKY) 10., 4. Julian Alaphilippe (FRA/DEC) 12., 5. Adam Yates (GBR/MIT) 16., 6. Patrick Konrad (AUT/BOR) 19., 7. Ion Izagirre (ESP/AST) 22., 8. Enric Mas (ESP/DEC) 24., 9. Geraint Thomas (GBR/SKY) 30., 10. Hugh Carthy (GBR/EF1) 31. Previous articleSports Racism – Football: Juventus Player Matuidi Disillusioned!